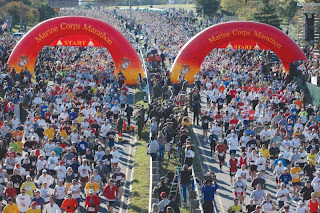 Eat, Run, Read: The Marine Corps Marathon This Weekend! Guess what's happening in DC this weekend? The Marine Corps Marathon! Alas, I will not be here to spectate...but I can tell you from 4 years of Boston Marathon experience (as in watching, not running), that getting out there to cheer for the runners is definitely worth your time! The race is October 25th (this Sunday). The field is 30,000 runners! The Wheelchair Marathon starts at 7:50am, and the Runner's Marathon starts at 8am. Even if you don't know any of the competitors, get out there and cheer for anyone! I know that at Boston, most of the runners write their names somewhere on themselves - as in on their legs/t-shirts/hats/whatever. My cheering strategy is to pick a person with their name and cheer as if they're my bff until they pass. The best is when someone is walking, or looking like they want to give up, and then you cheer, and they get going again! - Do not say "You're almost there!" unless they are in sight of the finish line. Runners mid-race do not appreciate being lied to. - Do not try to encourage people to "beat" others (e.g. Go get them, you can beat them!) Unless you're cheering for someone you know, keep things as positive as possible. - Do say "You look awesome/fast/strong!" I think that everyone enjoys a bit of flattery. - Do not be embarrassed to cheer loudly. It's better to overstate rather than understate your enthusiasm. - If you can, stay out there until the end - those at the back of the pace tend to a) need the most encouragement, b) have really interesting/good reasons to run, and c) be a really fun crowd. 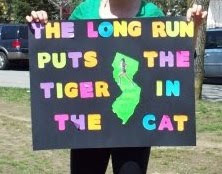 - If you know someone running, make a sign! And enlist those around you to cheer when your friend runs by. I recommend staying away from the start line and finish line. These places are absolute mayhem! If I were here to watch, I would probably go to the Mall, because runners pass by twice - once on either side. Driving on a marathon day can be a major issue because of road closings, etc., so either bike or walk to your chosen locale. Here is a link to the course map. The race starts at Arlington National Cemetery, and finishes at the Marine Corps Memorial in Arlington. Watch from the Lincoln Memorial to see runners at mile 10 and mile 16. The course goes around the National Mall - with the Smithsonian Museum marking miles 18 and 19. The Crystal City Metro Station marks miles 22 and 23, and includes live music and activities. For a complete spectator guide, go here. Also, there is a Marine Corps 10K! It starts on the Mall right across from the Smithsonian Metro Station, and follows the Marathon course. Start time is 8:05am. Get out there and cheer!! !